At Helm, we’re all about helping people to become extraordinary. You might not know this yet, but becoming extraordinary is a choice, your choice. It’s all down to your attitude and actions. When it comes to creating the right attitude, there’s no better way to build a success mindset than by learning from those who are already successful. We need to point out before we get going that John is not actually a Sir – not in the bended knee in front of the Queen sense anyway – it’s what we fondly call him at Helm because he’s a true gent with an incredible business mind. Armed with a degree in International Politics John decided to enter the world of… telecommunications. An odd choice, perhaps, but John admits he fell into the industry purely by chance and he’s been in love with it ever since. 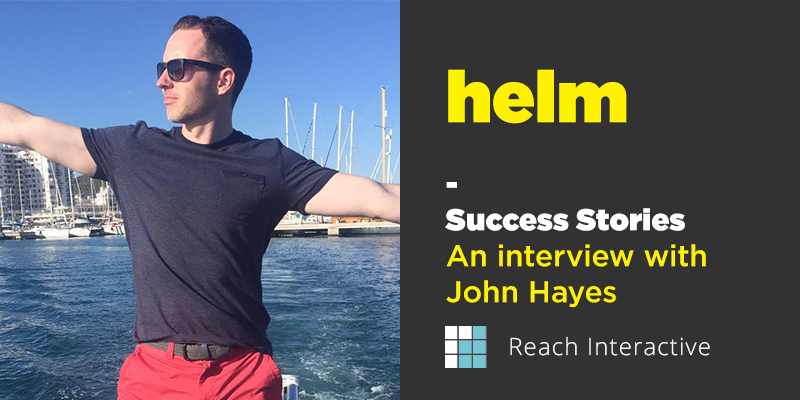 John is the Chief Operating Officer at Reach Interactive and has been with the company since the early days. Reach works with companies that want to use mass text messaging as part of their marketing campaign, and with a 98% open rate we don’t blame them! Over the last 10 years, John has worked hard to make Reach into one of the leading providers of text messaging services in the UK – that’s why we were so keen to pick his business brain. On that note, let’s see what John has to say. Helm: So John, why do you do what you do? JH: I fell into this industry completely by chance as a young graduate, desperately seeking a job to help pay the bills. 12 years later I’m still here and I love what we do. We get to work with clients from all over the world, and being part of an incredibly fast paced industry keeps you on your toes every day! JH: At the age of 23 I was invited to a meeting in Barcelona by the VP of mobile for one of Hollywood’s largest film studios. She’d come over from LA for a few days, and I was completely out of my comfort zone and felt way out of my depth. Needless to say, we got the contract! From that point on, I realise that age was a number and as long as you know what you’re talking about, people will give you the time of day and listen what you have to say. JH: Firstly, keep in mind that not all business advice is appropriate for your company. It’s easy for a business owner to find “advice” all over the internet these days, but if the person giving the advice hasn’t taken the time to understand your particular business and its issues, how can the advice be credible? Hard work is one of the key ingredients to getting a business off the ground. However, I believe in a work hard play hard mantra. Unless you treat yourself and the people around you to some critical non business time, life would be pretty dull and you’ll be a pretty dull person to be around. If you can find a way of creating a good work / life balance – you’ve cracked the jackpot! JH: Dot the I’s and cross the T’s. It’s all about the fine details – that’s what sets you apart. Early on in my career, we lost out on a client proposal due to a grammatical error in our sales literature. It made the client question our attention to detail. We all make mistakes, but I still think about that one particular incident all these years later. JH: I think the main change for me came when we started to grow the team and hire staff. We were now relying on other people to follow our vision and working standards. Learning to let go of control and let people do what they are good at was a big learning curve. 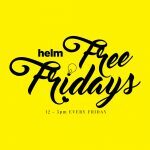 Helm: Besides money, what are your favourite ways to compensate people? JH: We run a flexible work/ life balance at Reach. Aside from the usual staff nights out once in awhile, we put a large focus on building a happy team atmosphere in our offices. There’s a lot of trust put in the staff to balance their working time with the needs of our customers, and so far it’s working pretty well. JH: I would have liked to have been geared up for what the next 5 years were going to look like. In the early days, it was very much a case of desperately trying to build and maintain a client list and pay the bills. Now we’re fortunate to be in a position where we can plan ahead years in advance and be more flexible with what we want to do as a company, and not necessary be led by commercial demands. JH: Have a clear definition of what you’re offering. Make sure you have an angle, such as a commercial benefit or a solution to a problem. Now find the key decision makers – Linkedin is a great tool to research the names of the relevant people within firms. Be human and throw the “sales script” out of the window. You may well be the tenth sales call that person has had that day. What makes you different? Find common ground and build on it. Most important of all – develop thick skin and never give up. Most of our current clients, once upon time said “not interested, we have a supplier” Sheer persistence is what get’s you through the door. Helm: Great answer! Thanks for taking the time to talk to us John, you’ve given us some real gems to take away and think about. – Work hard, but make sure you maintain a strong work / life balance. – Don’t be afraid to go for those big clients, someone has to get the contract – so why not you. – It’s all about the details. Pay attention and don’t get sloppy. – If you want to get anywhere in business you need to be persistent. If you’d like to talk to John about how Reach can help with your next marketing campaign you’ll find him on LinkedIn. Also, make sure to keep an eye out for our next success series interview, and if you’d like to learn more about how Helm can help you be extraordinary – give us a call on 01302 283 238 and arrange a time to drop by.